More and more startups from Switzerland are entering the international market, most notably in the Hightech and Life Science markets. In order to enable long-term growth, those young companies need to find the right investors. Thus, in the last couple of years, Venture Capital became more important and many funds were built in Switzerland. 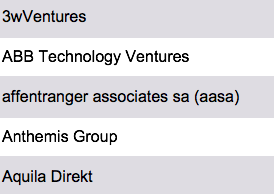 Some of them are focused on specific branches (FinTech, BioTech, CleanTech etc.) while others are more open to a broad variety of startups. You will save tons of time of exhausting research. 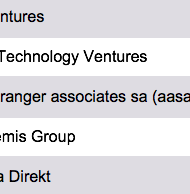 Our list offers detailed information about the most important Swiss Venture Capital Funds, which are investing in startups. You will be able to directly speak to the VCs through E-Mail, Post or Phone. We will help you with any requests and are happy to assist you with individual research. In case of any questions, or if you want to receive a Top 5 preview file, feel free to send an email to contact [at] researchgermany.com or to use our live-chat. We will even assist you to establish contact with Swiss companies or create custom-tailored lists for you.